Milan is one of the epicentres of Italian style and home to a growing number of cultural spaces that put fashion and design at their core. 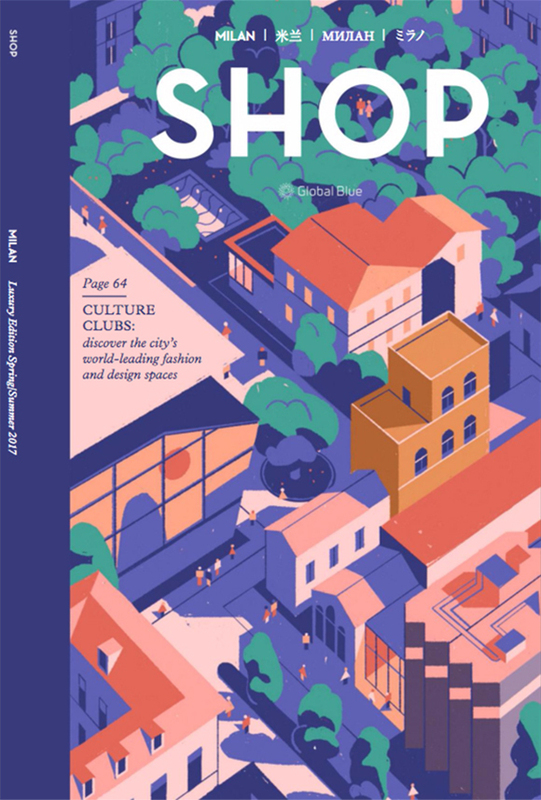 To celebrate Milan Design Week, the city’s most exciting cultural event of the year that is taking place this week, Shop Magazine has commissioned Matteo Berton to envision the city’s new icons but with a twist. Matteo used his architectural drawing skills and camera-like eye for composition to create a visual interpretation of the new Italian cultural hub. The cover depicts a leafy road dotted with quite recognisable buildings exceptionally standing side by side: the Prada Foundation, the architectonic austerity of the Armani Silos Museum, Villa Necchi of Guadagnino’s “I Am Love” fame, the brand new Museo del Design and the historic Pinoteca di Brera. New buildings adjoining historic landmarks highlight how the city’s DNA is steeped in design heritage and projected into the future. Matteo saturated the image with sun-drenched hues to recreate an astoundingly unique Italian landscape, something that all the visitors of the Salone del Mobile are bound the see!